I know what you’re thinking. Is there that much to actually say about the root of a tooth that I would even need a part 2? I know it’s just a root, but in some ways it can be pretty complicated and at times quite troublesome for some people. I can’t tell you how common it is for someone to come into the office and say “I have a toothache” or “I have a large cavity”. When I examine their teeth and check their x rays, I don’t usually find ‘that’ large cavity or in fact any cavity at all. The culprit? Usually an exposed root surface. 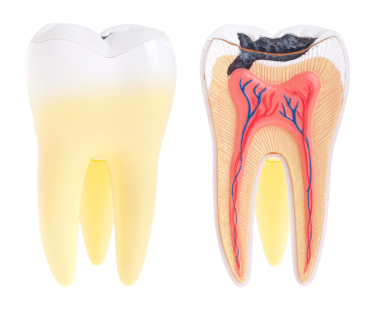 The root of the tooth has many tiny microscopic ‘holes’ that are actually direct channels that originate from a central nerve called the “pulp”. Usually the root surface, or the tiny holes that are responsible for the sensitivity, are covered up by the gums. Aside from ‘hard economic times’, recession is when the gums pull away and expose these root surfaces. Because they are direct extensions of the nerve, it hurts when the root surface is irritated; exposed to the cold, sweets or general contact are often the most disturbing. So, What to do? 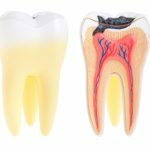 There are different ways to treat these sensitive nerve endings on the exposed root surfaces : One way is to use a toothpaste that is formulated to relieve the troublesome symptoms. By repeatedly applying a protective barrier of toothpaste, you could hopefully seal off the exposed nerve endings. We can also do something similar to this in the dental office. We repeatedly apply a ‘desensitizer’ to the affected area, which seals off the nerve endings. There are other ways to seal off the nerve endings and insulate the nerve. These can range from applying filling material to the affected area, to ‘gum grafting’ procedures. In most cases however, the sensitivity can easily be managed via the conservative approach of applying desensitizers in either the dental office or at your home, to the affected areas. The good news is that recession and exposure of the root surfaces can be prevented. Find out more in my next entry.